I have ordered several products from Cable Chick and have found them excellent to deal with. Deliveries are prompt and their products are exactly as described. Well done! Turn your ordinary power point into a dual USB charging centre! It seems like everything is USB charged these days, which means all the mains outlets in the house have someone's phone or tablet charger plugged into it, leaving you no room for other household appliances! At last! A sensible solution is at hand! Rather than having untidy power boards or stacks of double adapters cluttering up your walls and bench tops, this neat product lets you add two USB charging sockets to any regular power point. Perfect! 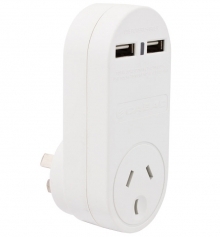 The design is simple and elegant - just plug this adaptor into any 240V mains power outlet and you're done. The mains socket remains available for larger appliances, and the two USB sockets are ready for charging up smartphones, powerbanks, MP3 players, PDAs, GPS, Bluetooth speakers & headphones, mobile phones and some tablets*. 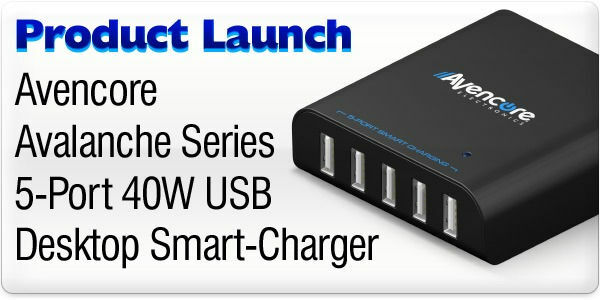 A blue light indicator shows the presence and availability of power to the USBs and together they can supply up to 1A for regular charging speeds on most devices. *Many large tablets and some new smartphones have a 2A power requirement for charging. Please check your devices to confirm a 1A charge is sufficient. The UPS came in on time and is working fine. Your delivery times are helping to make your site one I will go to more often! !